Guys have been getting a lot of attention lately and it’s no surprise. Just take a look around and you’ll notice more men are wearing classic, tailored haircuts. 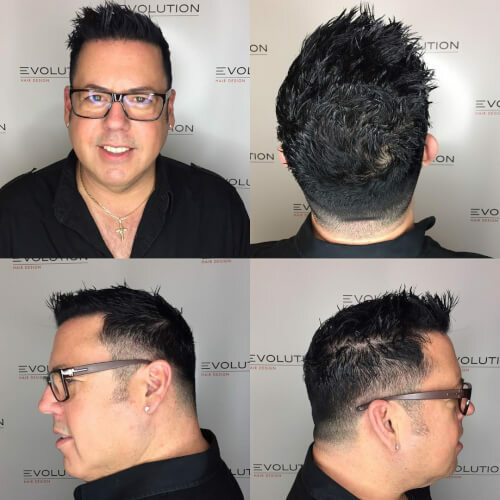 In last few years, we’ve seen a major resurgence in men’s traditional barbering styles. Looks ranging from tapered fades, to multi-textured styles and shoulder-length hair are all on trend. The key to the success of these cuts is precision, purpose and definition. 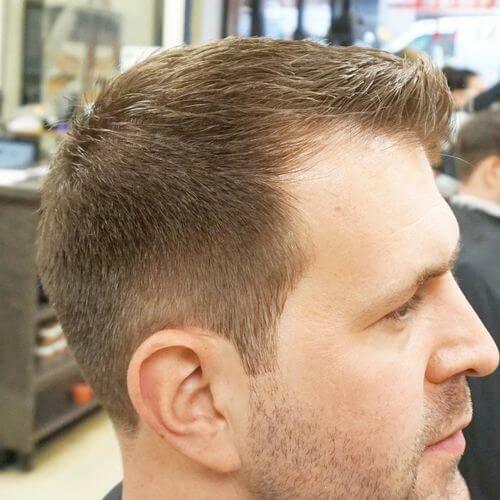 A great cut leads to easy styling and maintenance. Choosing the right styling aid is easier than ever with more men’s styling lines emerging on the market. This must be the reason these guys are looking so good…their style is effortless and cool! 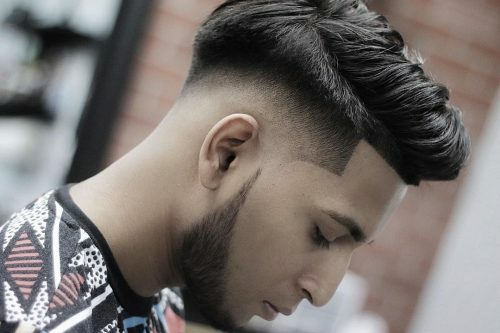 Find your next style inspiration with these amazing haircuts for men. This is a great look because it’s a kind of style that can be done with long hair or like in the picture, bringing it tighter on the sides! I would describe this kind of a neat, classic and fashionable look. My favorite thing about it is you can style it many different ways. Wear it with long hair for a more classic and elegant look, or you can go more trendy by taking it shorter on the sides. I have two products that I use for this look depending on the length of the hair. I recommend the Reuzel for shorter hair. It works really well and smells amazing. For longer hair, I recommend the American Crew Dust Powder. It is easy to work with and it leaves a natural look so you wouldn’t even know you had product in the hair! This style can suit anyone and that’s what I love about it. The only caveat to that would be if you are going to go right down the a zero like this one, I would have to say you need to be a young, fashionable person with sallow skin. Anyone who is active and likes to dress well can rock this look! My best tip would be to grow the hair out get a nice length going around the sides and back. This way the barber has a nice length to work with and can go with the natural hair growth. This is especially important for the parting to look better as we would be able to leave a nice bit of weight around the edges to separate the hair for a better finish! 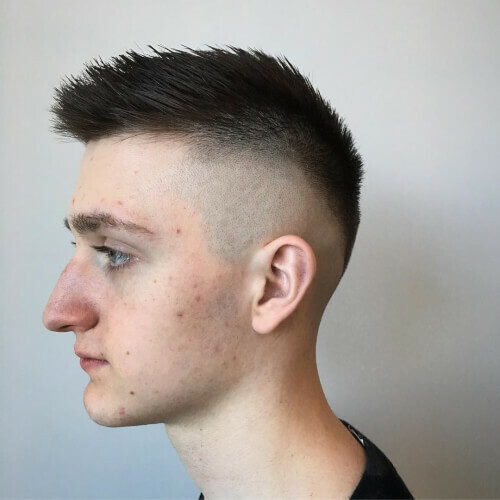 This haircut is a mid skin fade, which starts from zero. The major benefit of this hair is a clean, stylish look. You can prepare it many different ways, and that’s why I love this kind of haircut. I use the Kevin Murphy’s Rough.Rider to style the hair. It is a very strong hold matte clay. If the client prefers a bit shinier wax, I use the Uppercut’s Featherweight. It doesn’t matter that your hair is dark or bright, straight or curly, I think this look works best for all men. You can have different lengths on the top and you can wear it with a parting or without. It is definitely a versatile cut! Give it a try! You won’t regret it. If you are afraid to expose the skin that this look shows, try it starting from 3mm or 6mm as this also looks great. I call this a casual business man cut. My favorite thing about it is that it can be casual yet formal. I love using R+Co Aircraft to blow dry and finishing with Oribe Fiber Groom. The great thing about this haircut is that any hair type can work, all you need is the right product and a good blow dry. 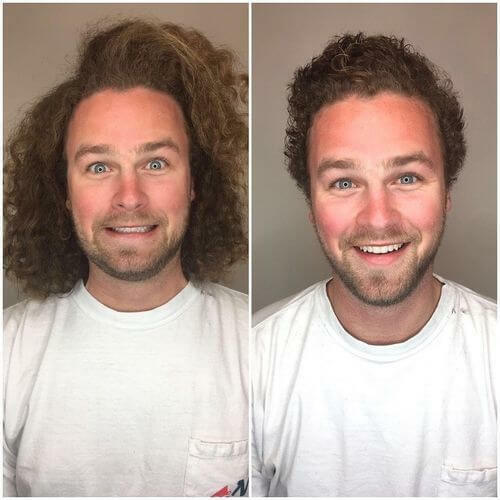 A blow dryer is a man’s best friend! 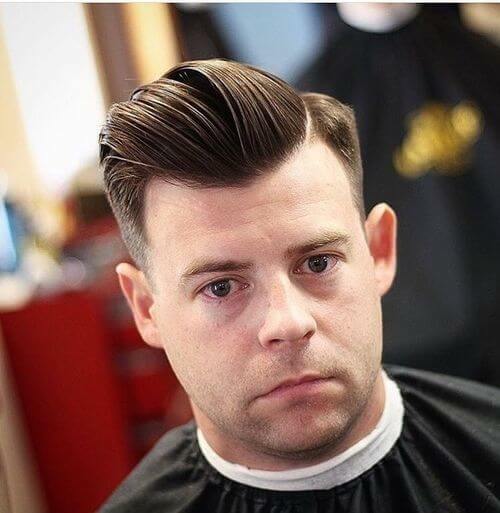 This is a short, slightly disconnected pompadour. I love the length of the front and how the added texture enhances the client’s natural wave. While the hair was wet, I used AG Sea Spray to mattify his fine hair, giving it a fuller look. Once the hair was dry, I raked AG Molding Cream through his hair with my fingers. This look is ideal for someone that has fine or medium density hair and someone that already has a good amount of length up top. It isn’t too edgy of a style, so it can be very versatile. 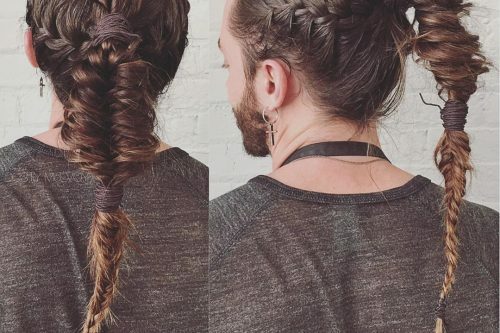 Be patient with growing a good amount of length on top before you try this. If you do not have enough length on top (three to five inches), the cut will not give you this exact look. This look is a mix of modern and classic. It has the perfect amount of length on top to style and the tapered sides and back give it a twist. I would call it the “I’m fresh out of college and ready for a great job, but I also want to hit the bars after work” look. My favorite part about it has to be the tapered neck with the long length to give room for styling. 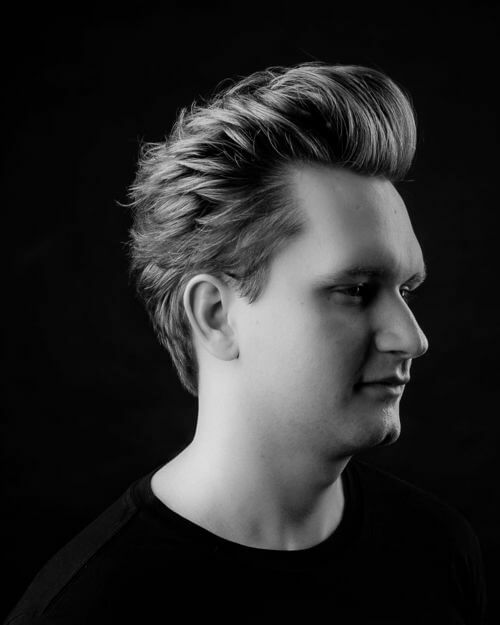 Any matte finish product with a strong-hold finishing hairspray will help to create this style. The product alone won’t do it if the hair isn’t trained, however. It would require some great blow drying. I used Texture Paste and Fierce Hold Hairspray by Arrojó to create this look. I would recommend this haircut to anyone who is willing to blow dry their hair every morning. This is for the guy who is willing to dress accordingly to suit the style of the haircut, and willing to put time and effort in the morning. Ideally, this style is for hair that is not too coarse. The more coarse the hair, the harder it will be to achieve the style. 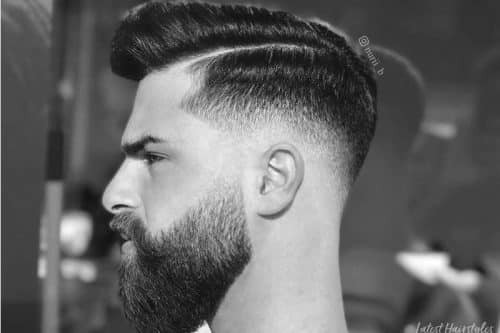 Because this haircut isn’t too tight on the sides, any guy can pull it off whether he has a round face or chiseled chin. 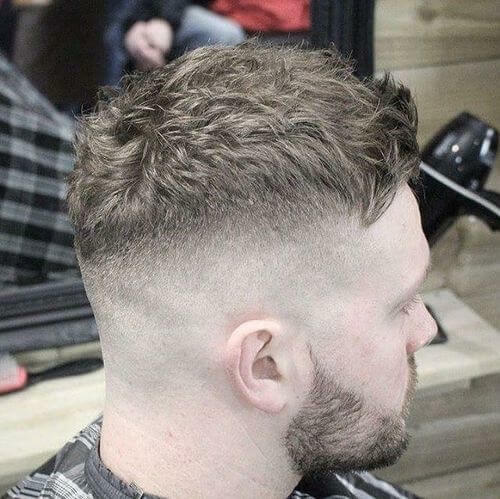 I would describe this look as a bald fade undercut up to a number 1 with a hard part. The best thing about the undercut is that it is a versatile style. You could potentially wear it to either direction or straight back with the right cut. It allows your clients to get the full longevity of a haircut by removing the bulk around the edges as much as possible in between visits. It’s important to find a good cut for your client’s lifestyle and this is the most important question in my consultations. Unfortunately, I didn’t get to clean up the beard on this client because he was going to remove it all at home. The product I personally use is Bonafide Pomade. Pomade is (in my opinion) the best option for guys on the go. 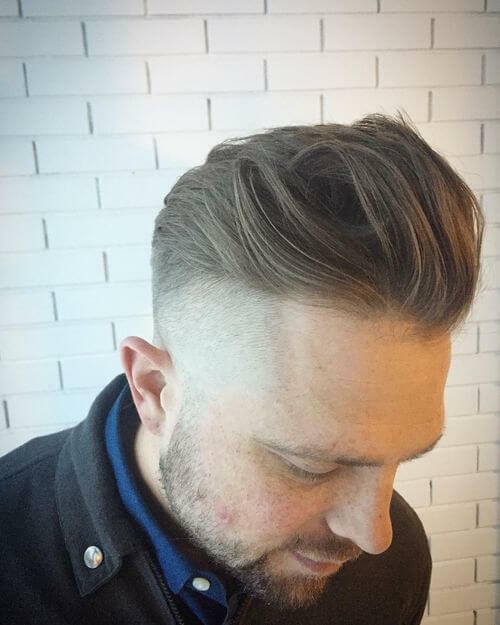 The product for this particular style is a water-based pomade. In essence, the water base allows you to have a good hold without the feeling of too much product for the everyday man. It also allows you the most options in styling due to the flexibility of the product. But of course, the key to styling is in the blow dry technique as well as the use of a round brush or vent brush, depending on your length. The type of client I recommend this style for is anyone who is willing to put a little bit of effort into their hair in the morning. Overall, the style time on this is less then five minutes and is easily achieved with very little practice. 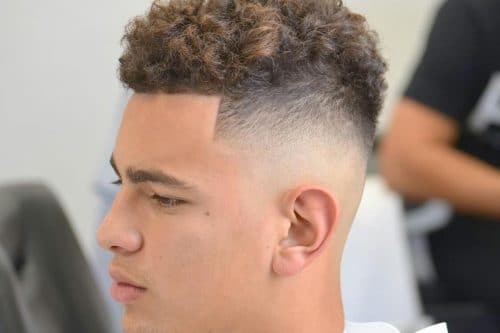 Hair type wise, I would usually avoid this cut on anyone with curly to very curly hair because it will not sit over to the side in the right fashion. I recommend this look for any face shape, with the exception of an extremely round face. The weight being gone from the top is not flattering on a round shaped head. Overall, when this is styled in a pompadour fashion, the style is timeless and could fit any setting professional or not. I would describe this look as a bald fade or skin fade. What I like about it is the dramatic look it gives. This guest asked for something different than what we did the last time and this is what I suggested. He loved it. I would recommend a paste with a strong hold. We used Tex Paste by V76 by Vaughn. I love the hold it has and it also has a nice matte finish for that lived in textured look. I also sometimes like to use Rough Luxury Soft by Oribe. It has a nice creamy consistency as you work it in your hands. It allows enough time for you to get your style and shape in and once it starts to dry it locks the look in place. The type of guest that I think of would be someone who is looking for something sharp and clean. Anyone who has an oval, round, or square face shape would be great for the look. For those who have fine textured hair to medium would be great for this as well. I would recommend this guest to come back and see me in about 2-3 weeks to maintain the look. This particular guest sees me every 3 weeks and he has a finer texture but has a lot of it. If you’re one that doesn’t really love to style their hair or get hair cuts very often, this may not be the look for you. 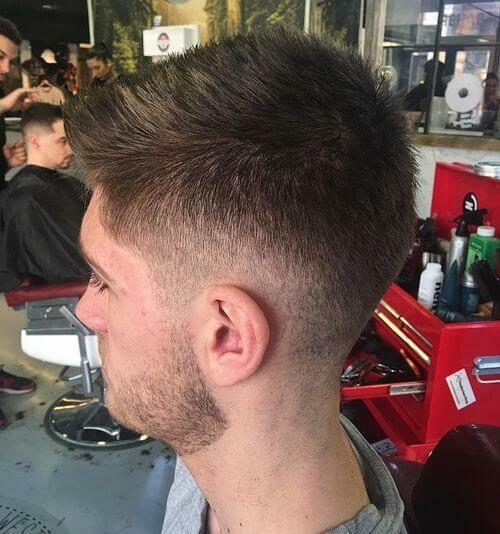 I would describe this as a versatile, edgy look accompanied with a clean cut fade. 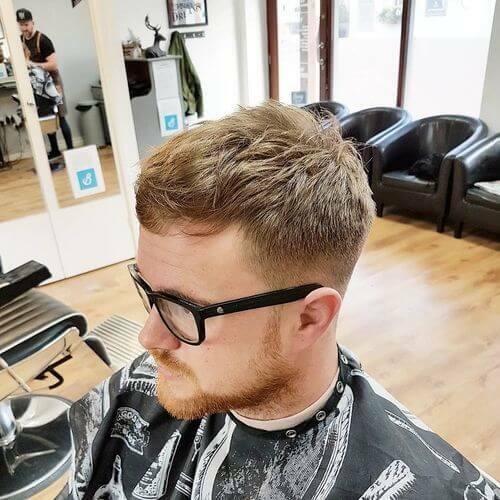 This was cut with clippers and razor to give it the clean cut sides and back and jagged top making this easy to upkeep and easy to style. My favorite thing about this look was how versatile and edgy it really is. It is all in how you style it. If my guest isn’t feeling like wearing this specific look everyday it’s easy to change the style and direction day to day without having to recut a new look. The products that I used for this particular look was Wax by Keune Blend. This will give a look that stays put, but can still be manipulated if wanted. The wax allows for a wet look, and the product can go on towel dried hair for a quick style. For a little more volume and movement in the hair use American Crews defining pastes accompanied by some of Crews boost powder. The defining paste should go on damp hair and wait to put in the boost powder until the hair is closer to dry and/or remove some moisture with a blow dryer before using it. This look is good for medium to coarse texture of hair and can easily be worn on most any facial structure as it has room for adjusting in height and movement. This look is edgy without being over the top, and easy to style which makes its conducive to many personalities and lifestyles. This is a textured and lived-in gentlemen’s cut. My favorite thing about it is how effortless the style is. It will always look good. The shape and texture will allow him to wake up and go with minimal styling. It also looks like he didn’t just leave the barbershop, hence why we’re calling it “lived in”. There is no product in this haircut. This hairstyle was blow dried into place with medium heat. Products should never make a haircut look good, the haircut should make the haircut look good. I try to only use products to bring out a natural fitting style for that particular individual. If I were to use product for this particular cut, I use use a wig powder such as American Crew or OSIS Dust It flex powder. Both are very lightweight and as long as used properly, they can give the hair amazing lift and texture. I could also finish it with a very light grooming cream to make it pop. I think it’s important for a style like this to look as natural as possible. Besides, a heavier product would weigh it down and make it look too oily and flat. I think this look would be perfect for anyone who wants a relaxed, loose style. 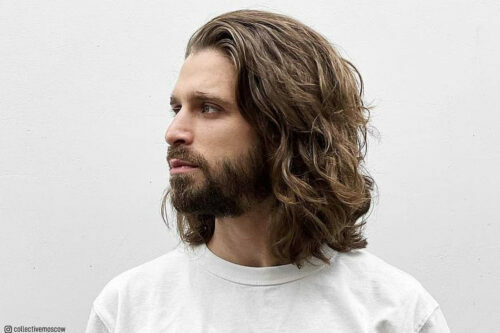 Medium to course wavy hair would be ideal to pull this style off right. Also, If you’re a wake up and out the door type of person, this cut may be for you. 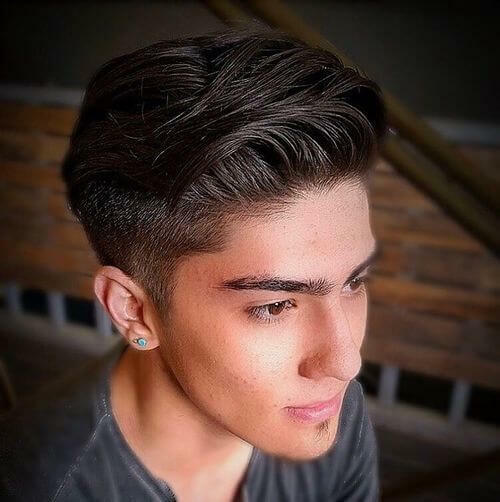 My best advice for someone who is thinking about this type of cut and style is to first grow your hair out and begin to comb or style your hair is that same fashion. 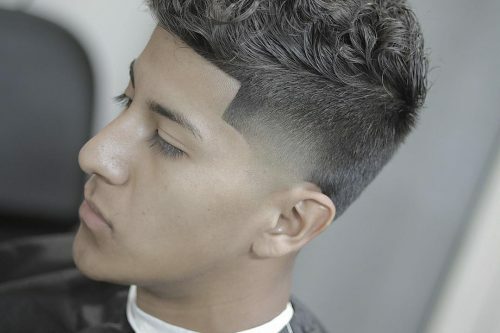 Show a picture of this cut or a similar style to your barber and see if it’s something they feel comfortable with. 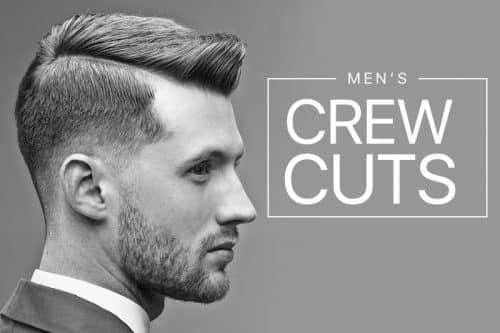 This particular haircut was a complete scissor cut, so make sure your hair cutter can use a pair of scissors. If you don’t have a barber or hair cutter, find one by checking Instagram and Yelp, or talk to your friends and find out where they go. It’s important to find a hair cutter who you mesh well with and one you trust to cut your locks. Just remember, it’s not about the hair you cut off, it’s the hair you leave on that matters. I would describe it as a mix of short textured mess on top with a straight and determined triangular outline on front. 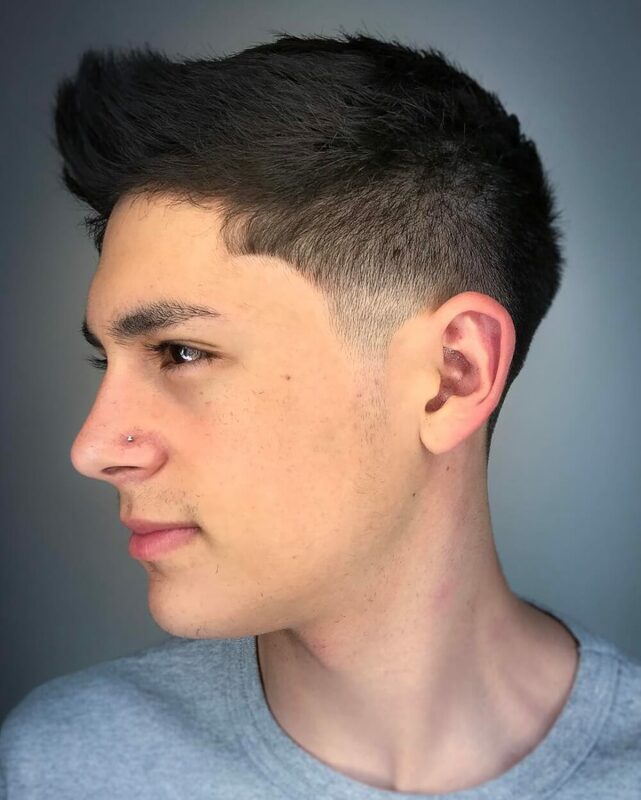 This makes this haircut look solid and gives great look even if not styled. 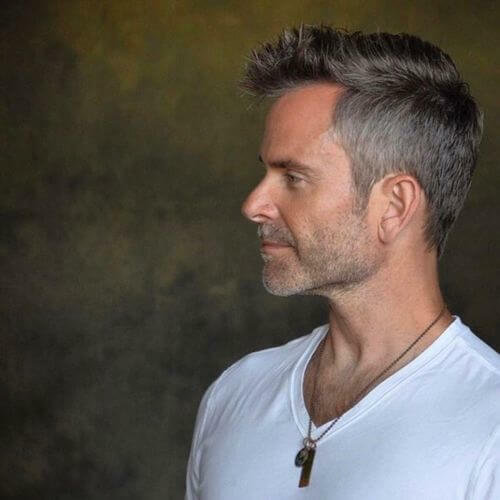 I recommend to combine a low fade or mid fade with short textured hair (above 1 1/2-inch or maximum of 2 inches for fine to medium hair types, so it should not look like a crop because it is not that messy and bulky on top), and a maximum sharp rounded or triangular outline in front (depending on hair grown, outline should be natural but sharp). Of course you should use clay or paste to create a messy look, or some brands have an anti-gravity powder which textures perfectly and helps to keep the look as long as possible during the day. 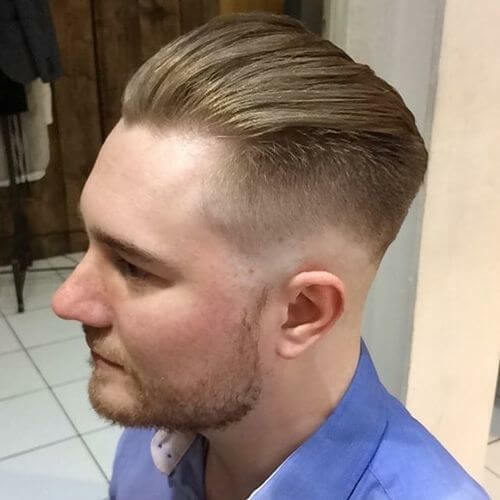 This was done with Clubman’s Brilliantine and I included some twist sponge action to give it a healthy shine and add some “bad guy” attitude. I recommend this haircut for almost all hair types. This is a contour hair shape cut, so it can work on almost any face shape except those who has upside down triangular face shape. 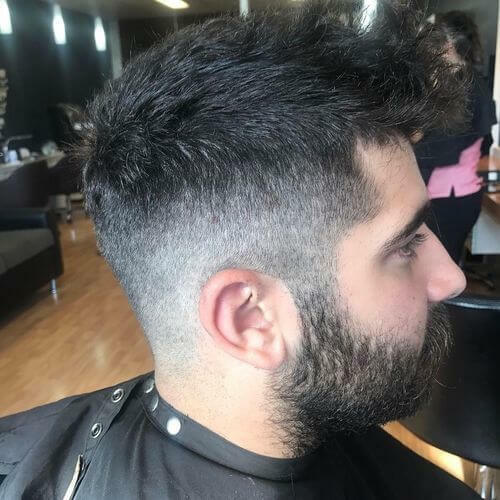 This haircut works for any lifestyle, particularly those who don’t have much time to spend in front of a mirror, but still want to have a stylish haircut. I like this look because it is unique to this specific client. This hairstyle is all things sharp and classy, while still holding true to an urban feel. Personally, I like my hair short with little to no maintenance. 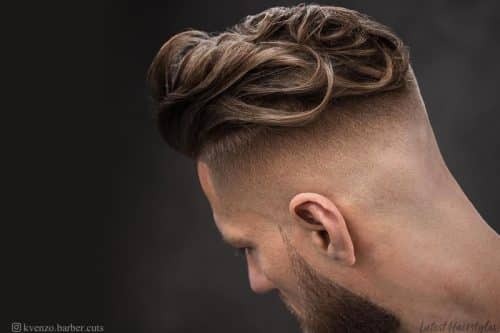 This hairstyle is a “no maintenance” haircut. This means that this client doesn’t need a blow dryer, product, or even a comb to recreate this style on his own. The tools I used to create this haircut are the Wahl Magic Clips (zero gapped) with the standard guard attachments, Andis Slimline Pro Li, and Dorko Prime blades. I would recommend this haircut for anyone that wants their hair to look clean, short and sharp without any morning or midday maintenance. I believe that the pre-haircut consultation is as important (if not more important) than the actual haircut. Catering to your client, rather than the hair is, what you should strive for. Everyone’s hair is different, so you need to establish what your customer/client is looking to get out of the haircut. Something I would recommend for barbers and stylists alike is to find out what your client’s hair goals are (short/long, styled/messy, natural/sharp, if they mind maintaining their hair daily, etc.) and communicate what haircut and style would look best with their hair type and head shape. 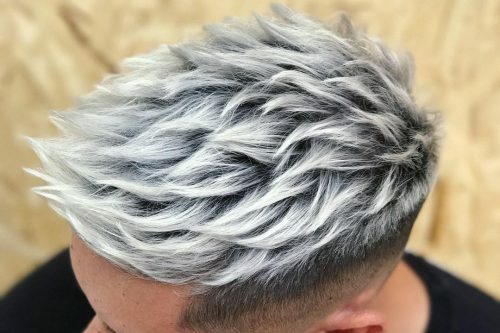 This is a short textured haircut. My favorite thing about this haircut is that it is very low maintenance but has lots fo styling options. You can wear it classic or messy or somewhere in between. This is a matte finish look. I used Davines More Inside, which is a strong molding clay. Professionals, dads, students and athletes. Really anyone can wear this look as long as they have straight hair without too much wave. I love this clean cut and the versatility of the cut. It can be worn without product for a more casual dressed down look, or with product for a more stylish to formal look . I love and recommend Grit – Elements range for the texture it gives and Pomade – DMAM range for shine. All of these products are by De Lorenzo . ill suitable for other hair textures and face shapes, the key is to balance the overall haircut to suit the features. This is a very trendy look right now. 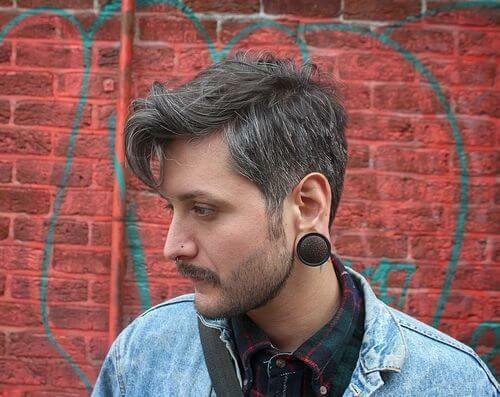 This look is basically an undercut on the sides and left longer through the top. My favorite part is the texture through the top to give it more interest. I used Aveda’s Phomollient when the hair was wet and blew it dry from side to side to give good lift. I finished the look off with some Men’s Grooming Clay (also by Aveda) to give it some hold and some texture. I really think this is a very versatile look for many men. The greatest part is that even if you have fine hair, you can have something similar. It just might not be as long throughout the top. This look is very easy to style as well. If you want to take the time and blow dry it takes five minutes. If not, you can still get a similar look with just not as much lift. 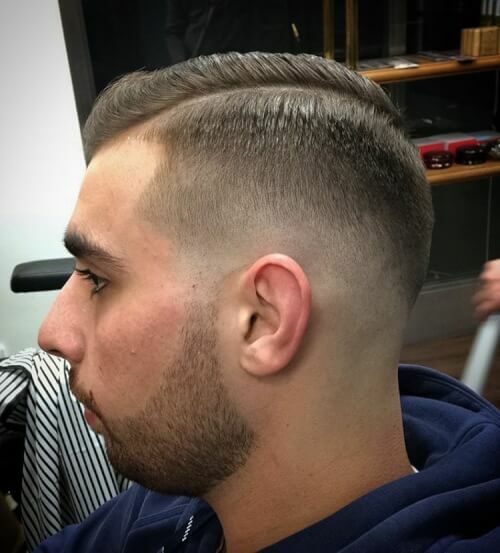 This is a high skin fade with a textured quiff. My favorite thing is how clean and sharp it looks. I used Osmo Matte Clay Extreme to style the top after a blow dry with Osmo Salt Spray. I have a lot of customers that want this look. It’s suitable in all environments from a fashionable statement to an executive businessman. It works better on thick, straighter hairstyles and would be impossible to recreate on curly hair. Because this style is kept square around the edges to frame the face, it would look good on the majority of different face shapes. 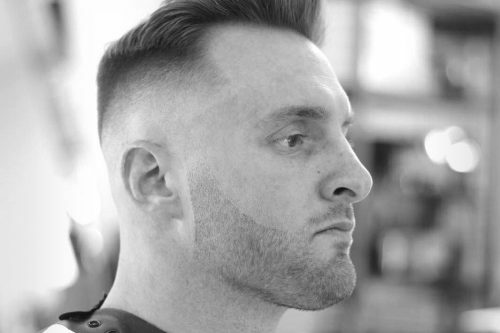 This is a straight razor fade. I love this haircut because it gives my client a clean cut look! No products were used to create this look other than my Wahl buzzer, straight razor and a hot lather! This hairstyle is pretty much universal and can be customized for any client in your chair. This hairstyle works best on a thicker hair type. Usually any face shape will work with this hairstyle. I recommend this haircut for anyone working in business, law enforcement or any man who wants to look clean shaven!! I would describe this as a skin fade with a hard razor side part. The top is left a little bit long and worn messy. I would recommend Paul Mitchell Tea Tree shaping cream for this style. It’s great for a messy yet flexible look with medium hold. 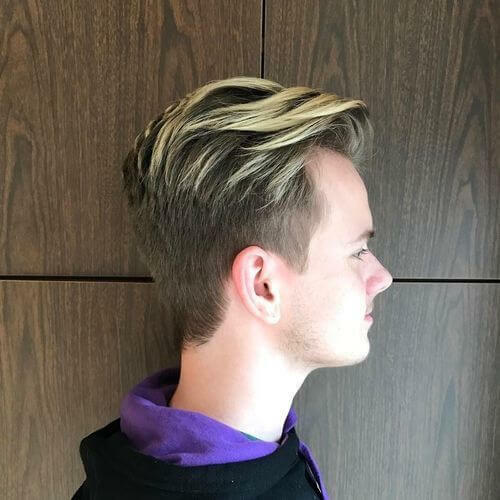 I would recommend this haircut for someone that doesn’t want much daily maintenance, but doesn’t mind getting haircuts pretty regularly to keep it up. American Crew Defining Paste gives a lovely matte finish and allows for movement and definition, as well as good hold! I would recommend this look to a gent with thicker hair as that helps to create a fuller shape and adds definition to the style. This look can easily be recommended for a more corporate look or a modern day hipster, depending on how we choose to style. My client needed something he could wear in his workplace. He was ready for something clean cut and professional, so we went short on the sides and left the top a little bit longer, blending the two together. My favorite thing about it is that the style is easy to recreate! To create this look, I used Oribe Curl Control Silkening Creme and finished it with R+Co Motorcycle flexible gel. For curly hair I would recommend something with moisture for frizz and also something with control and hold. I would recommend this look to anyone! It’s professional, but you can also wear it casual. With a little product, it’s easy to recreate and it’s something the client can easily maintain. This is a modern short crop with a short textured finish. The sides are taken down to a skin-tight length using a foil machine and a straight edge razor. My favorite thing about it would be the low maintenance it is for the client. 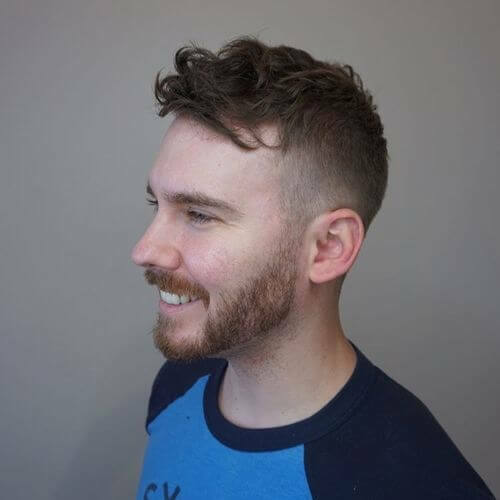 I think this style is best for someone who has a funky sense of dress and also wants a low maintenance, cool-looking cut that you can style quickly after popping out of the shower. 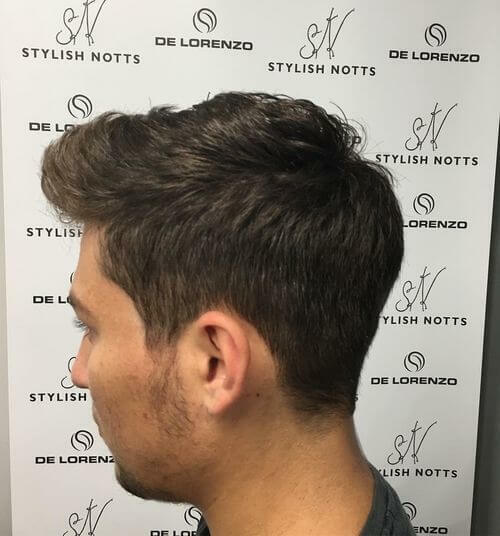 This haircut has a high volume of texture put through it to create the messy, textured finish. I dried sea salt spray into the hair, then used a small amount of Klay to give it extra hold and leave it with a matte finish. I recommend this style for someone looking for a low maintenance but stylish look. 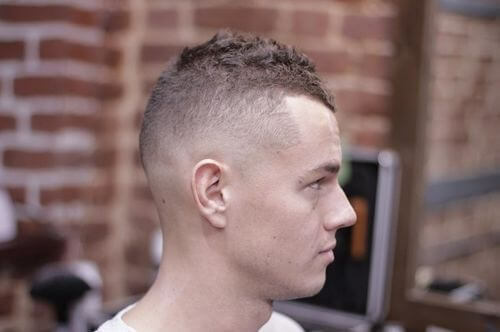 This haircut would compliment a client with a masculine shaped face and jawline. It is perfect for finer hair types because it gives body. 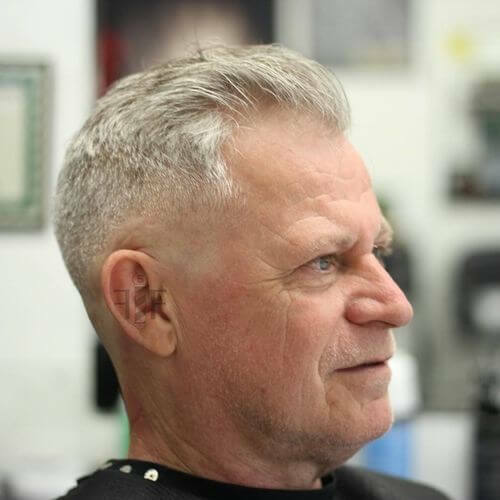 This look is a combover, hard part skin fade and is one of the most popular styles out today. This is a very nice professional look that is clean cut and goes with any outfit or function you may be going to. My favorite thing about this cut is the hard part. Its unique part makes the cut pop to create a nice look. 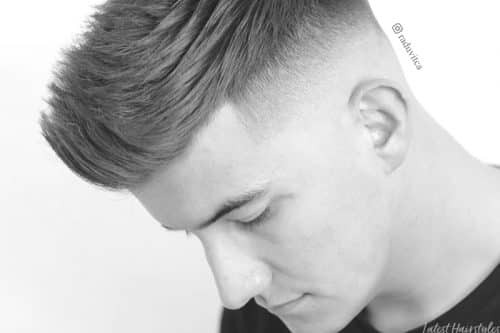 Style this cut with pomade and a comb. Comb it over to the side, flip the front up with a little grooming spray, and off you go. Just note that this cut is a higher maintenance haircut. I recommend coming in every one to two weeks for a haircut. This cut fits anyone or any hair type that likes short hair. It fits all activities and lifestyles. You will never look out of place with this cut! My favorite thing about this haircut is how fluid it is. It’s natural, but still super sharp with its low taper. To create the shape, I used Reuzel Grooming Tonic to create volume and give it hold. I finished the look with Reuzel Pink to give it that slick, classic greaser image. I’d recommend this style of look to anyone who wants to look classy, yet well kept and current. The advantage of having a parting and blow drying the hair is that it manipulates the face shape and elongates the face. 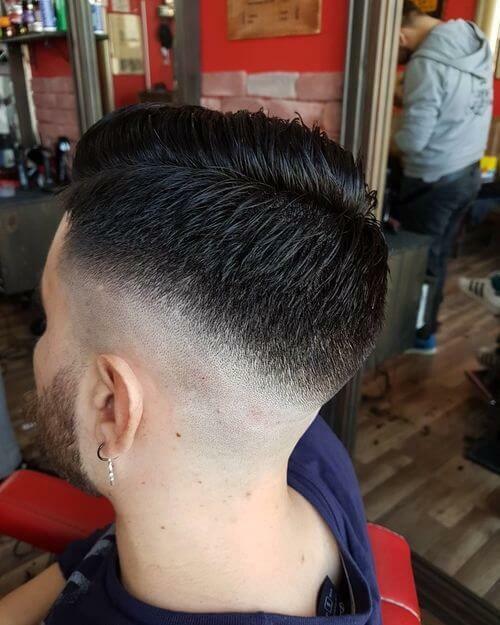 This is one of my favorite haircuts to do because it is a mix of a really tight and low skin fade with loads of length on top. The disconnection is really evident and the contrast works really well. While blow drying I used American Crew Boost Cream. For styling, I used American Crew Boost Powder and Fudge Matte Head Extra, then finished with Got2B Hairspray. This type of style can really suit anyone, which is the great thing about it. 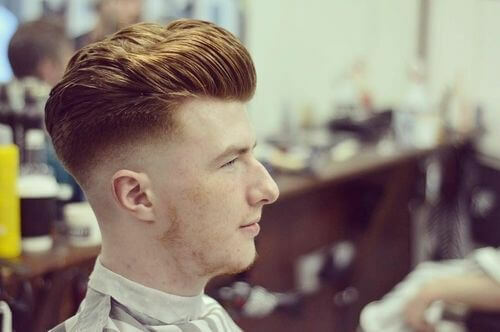 The length on top creates a very masculine and trendy feel without having loads of length at the sides which some gents may not like. 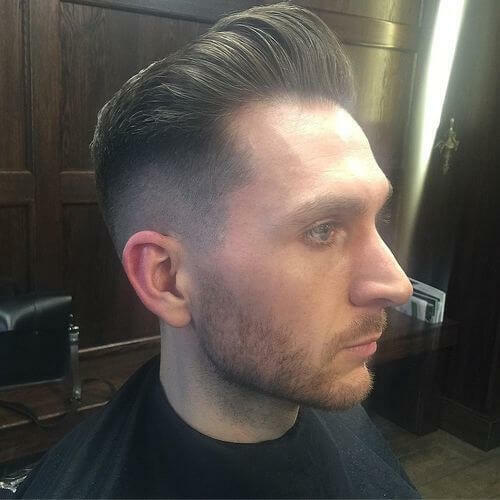 This haircut can be changed into a couple of different styles like a side parting that is very slick on top, or the more loose finish shown here. 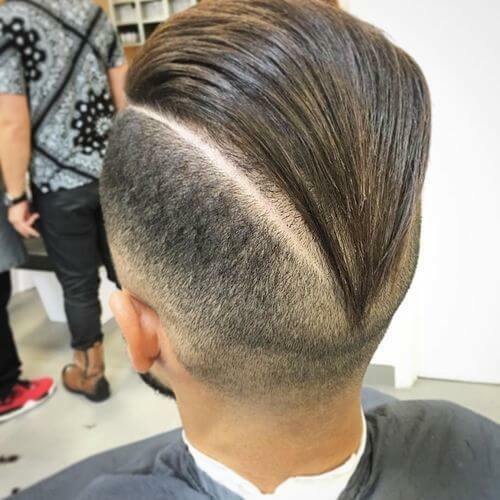 This is a mid skin fade combover with a natural part on the side. My favorite thing about this haircut is the contrast from light to dark on the skin fade. The product that I used to style this haircut is a Jojoba Crystal wax made by Monplatin Design. Any wax or paste product will work as well, depending on the client’s preference. 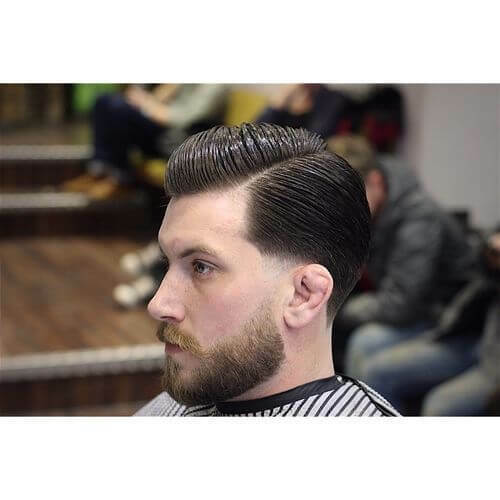 Some like a wet look which is achieved through a wax or pomade, while others like a more natural look which can be achieved using a clay or matte paste. 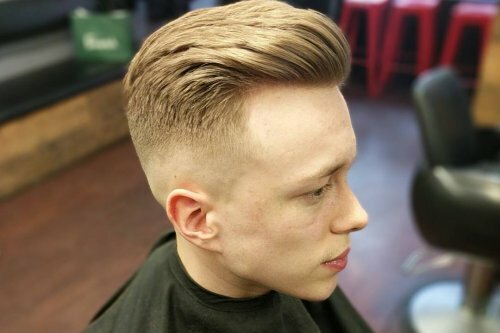 I would recommend this type of haircut to any of my clients with any type of face structure. As long as you follow where the crown naturally falls, you’ll be fine. In terms of hair textures, I find it works best with straight to wavy hair and from medium to thin types of hair. 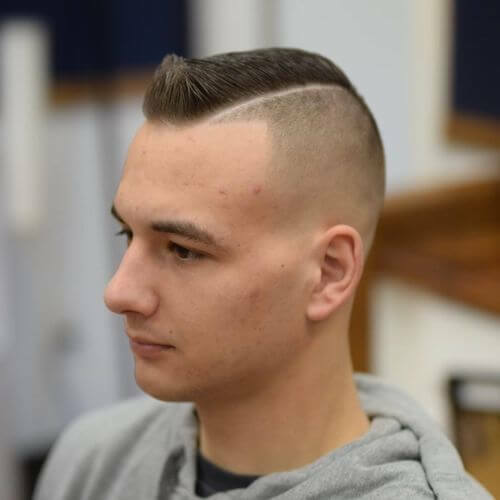 This style is versatile enough for hipsters, everyday professionals and all different lifestyles as it can be altered and worn in a variety of combovers. This is a longer version of the cropped haircut. My favorite thing about it is the natural looking texture that clients can add to their hair by using their own fingers. I recommend using IQ Clever Dust, or any light hold and matte looking wax. This look is most suitable for young clients. When they ask for a fringe hanging down, I usually add some texture by point cutting and using the styling blade and thinning scissors at the ends of the hair to create this natural, messy look. The shape of the face doesn’t really matter much because you can work on the shape of the head. The recommended hair texture varies from very curly hair to straight hair. The difference will simply be the product you will be using in it. 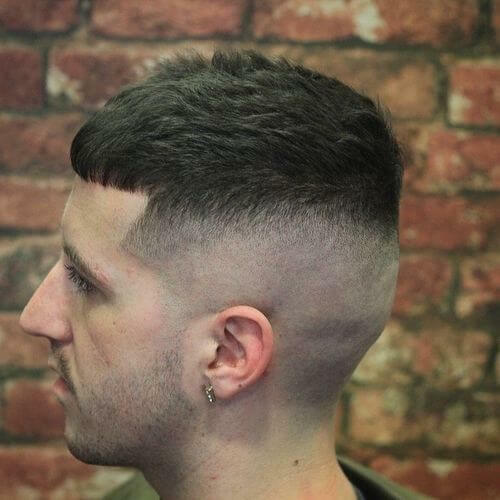 This is a low skin fade with a messy waved top. My favorite part about it is the color of his hair, but also the curve of the fade. I used salt spray and a diffuser to curl the top. Use a pea-sized amount of any standard matte clay or paste to give it some separation. Any client with a slight wave or curl in their hair can achieve this style. It honestly seams to suit every man. 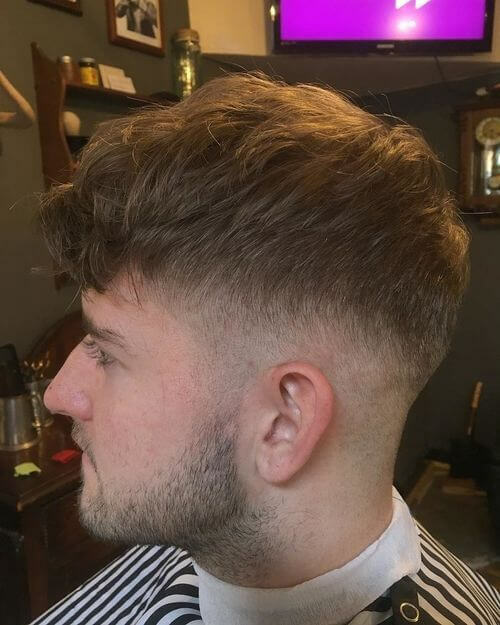 This haircut features a fade on the sides and a disconnect at the top. There is a line on one side with an elevated “V” finish. I recommend “White” molding fiber cream from the ROLDA line. This cut is recommended for hair with fine texture and low volume. It looks great on round, oval or square face shapes. It is the perfect cut an style for those who like fashion and a modern look. This is a neat, clean and sharp haircut. My favorite thing about it is the contrast from very short on the sides to long on the top with the added parting. The product I recommend to recreate his style would be a matte clay as it has a long lasting hold which works well with the long length on the top. This look would suit any client at any age, as long as they have the length to work with. I blow dried the front to give it lift. This particular client has a wide face so lift at the front compliments the client. If it was flat it would emphasize his wide face. Finally it would probably suit someone who works indoors rather than someone that works outside such as a builder as it would get irritating while working! 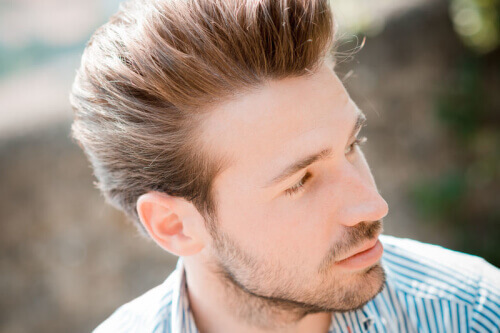 This is a natural and short mens hairstyle with a lot of choppy texture. It was all done using scissors and a point cutting technique which gives it the natural texture in the cut. I really like this haircut because the cut has options. The top is long enough to push to the side for a combover, or it can be worn messy to give you the “just rolled out of bed” look. I recommend a pomade for a wet look. If you want a more natural look, go with a matte paste or a forming cream. 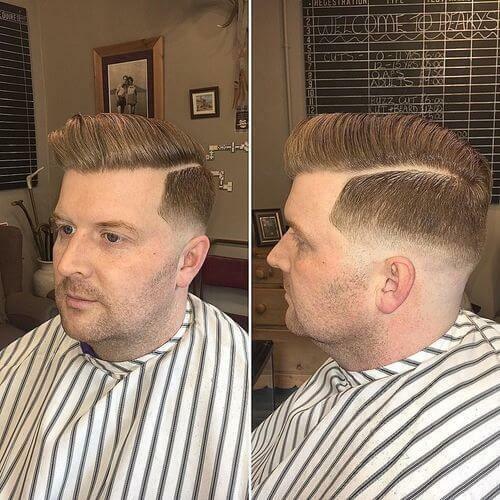 This cut is great for the men who like to switch it up. Rock it to the side when going to the office, then wear it messy for the weekends. 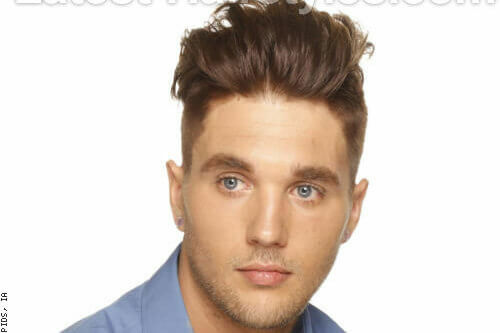 Any face shape or hair type works with this haircut and that’s why its so popular. A lot of young business class guys wear it because its look professional, yet cool. 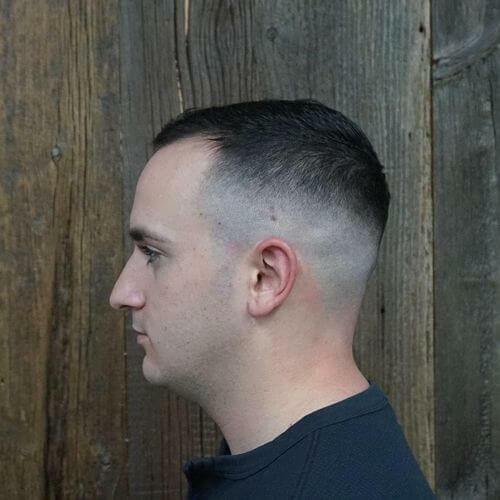 This is a loose pomp skin fade. My favorite thing about it is the classic look and clean lines. I would recommend this look for someone who has time to take care of their hair in the morning, as well as someone with thick hair that is looking for a classic look. We usually use pomade for side partings, especially if they are short, simply for the ease of styling. We don’t want the customer going home and getting frustrated when they try to fix their hair the next day. Pomade is a very easy product to use and you don’t even need of a blow dryer most of the time. I would not give this cut to someone with thin hair because it won’t pop out that much. It’s better suited for medium to thick hair and for someone that can carry this style. People ask for skin fades when they have a bit of a free and wild lifestyle. This look is unstructured, versatile and overall handsome. The best part of this haircut is that it will always looks good because it is effortless. There is length through the top, but it connects to the sides and back in all the right places. This allows for pieces to fall, but still creates a square and masculine shape. All you need is about three minutes to run some Reuzel Grooming Tonic through (quick blow dry if you can) and finish with a nice firm hold matte product. My favorite is Baxter Clay Pomade. If you want to suit up and make this look a little more professional, you can use a shine pomade to give a more slicked back look. I would recommend Red Reuzel for that. This look will suit almost any lifestyle. This cut is short in all the right places and grows out great. If you’re looking to change up your style, try this one out! This is a cool, sharp and classic look. I love the comb lines through the sides,. It’s a nice change from all the skin fades around these days. 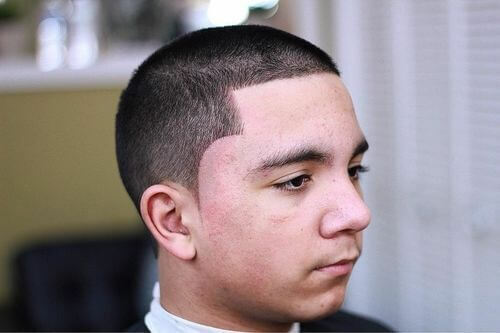 This haircut does taper down to the skin, but is kept low to give a classic style a modern twist. I used Uppercut Delux Pomade to create the look. It has just the right amount of shine and washes out with water. 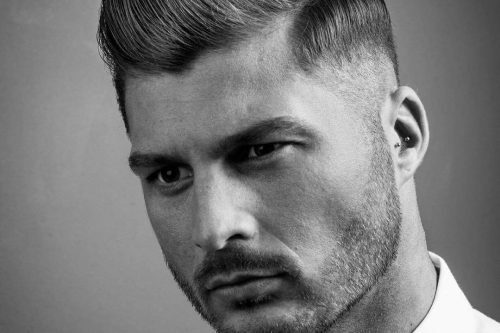 I think this hairstyle would suit most guys whether your a tattooed biker or a banker that works in the city. Personally, I think it looks best on dark, thick hair as it shows the taper off well, but it can work on any texture. Even curly hair looks great in this cut. Just go with the curls and don’t slick them down. This look is a favorite for gentlemen with thick straight hair who want a more sleek look. It is basically an undercut with a ton of texturizing on top. I used Grooming Tonic by Reuzel first, applying it while the hair was still wet to provide more hold and structure alongside the blow dry. I then worked in Kevin Murphy’s Nightrider to control flyaways and provide hold for his overall shape. This look is especially great for clients with thick and dense hair. Having an undercut allows for a sleek look that stick straight hair doesn’t always allow. Removing bulk from the sides accentuates the jawline and gives his face a more square/masculine quality. This is a more natural looking fade. 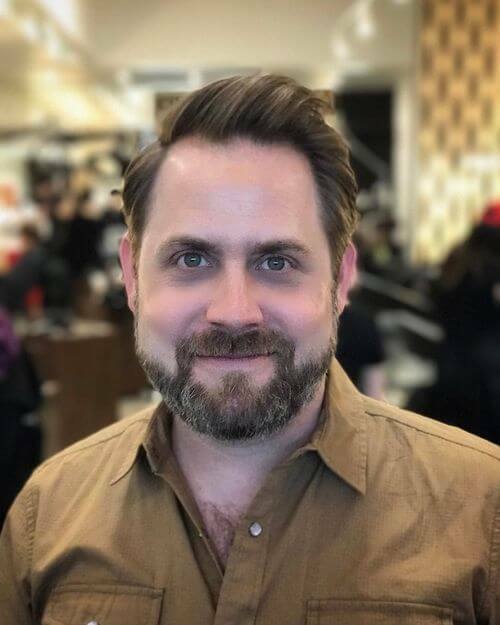 Most of my men’s clients do not style their hair at home, so they require a haircut that sits well without product or styling. Even though it’s low maintenance, the fade looks modern and professional, and that’s what I love about it. It’s effortlessly sophisticated. To recreate this look, all you need is a good haircut! A good haircut should sit well without product, as the majority of male clients only style their hair for special occasions. However, my go-to men’s product is Reuzel! I would recommend this look for clients who have thick hair and find it hard to manage. This is a natural and effortless look that plays off the texture of the client’s hair. My favorite thing about the hairstyle is the cut. It is cut so he wear it in a classic, clean cut style or wear it rough and messy as well. 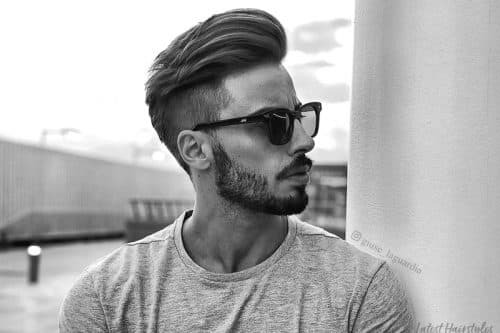 I recommend this hairstyle for men with fine to thick hair that is wavy or straight. Fine to normal hair should be cut with scissors, and thick hair should be cut with a razor to get the shape. This style is suitable for both classic office wear and the more rebellious types. I used American Crew Boost Creme to blow dry the hair into shape, using my fingers to create volume. I then used Boost Powder by American Crew at the roots to add separation and give the natural look. Any creme or gel or mousse to blow dry the volume in will do, and either paste or powder to finish the look will work as well. This look is an executive contour. 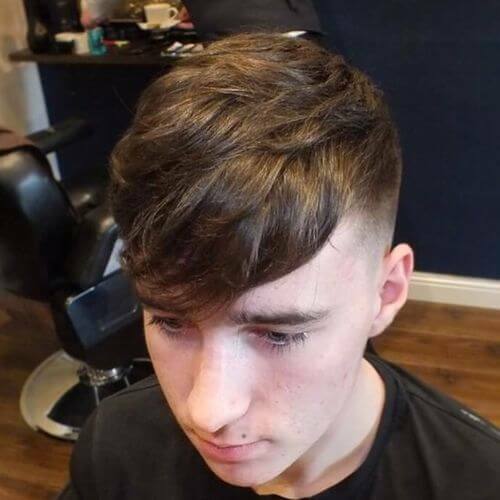 What I like most about this cut is that although it is a common haircut, there are several variations in length and in styling. It is a timeless classic, and even when trends in hair change, this is one of the styles that will never go away. It has been time proven. Although most people tend to go towards products with a matte or natural finish, I like to use products with shine. In this particular cut, I used Reuzel Green and Red. The Green is a grease pomade and I applied that first as a base. I then used the Red which is a water-soluble pomade. This will add a little extra hold and help rinse out the grease when the client washes his hair. 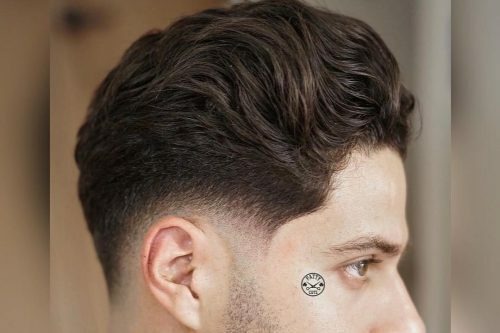 I would recommend this hairstyle to someone who is willing to use product to style their hair and doesn’t mind taking a little time to run a comb through it. 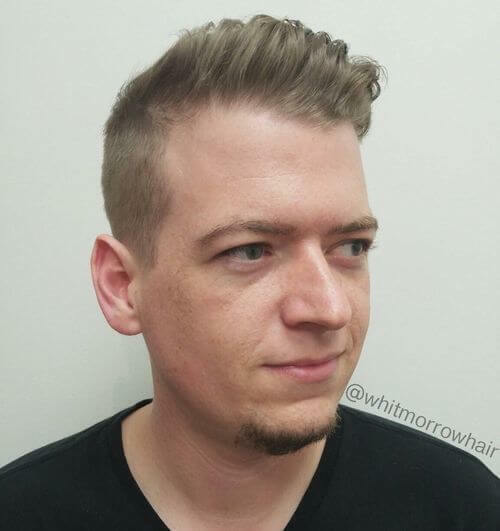 This cut can be worn more casual with less product applied, but it is a bit old school so I think it looks best with some pomade and combed through carefully. It will look great in street clothes or in a suit. You can’t go wrong with an executive contour! I use all Andis products. For this cut I use a ceramic 00000 blade on the Andis Supra ZR to cut the hair down to the skin. For the fade, I used the Andis Cordless Envy. 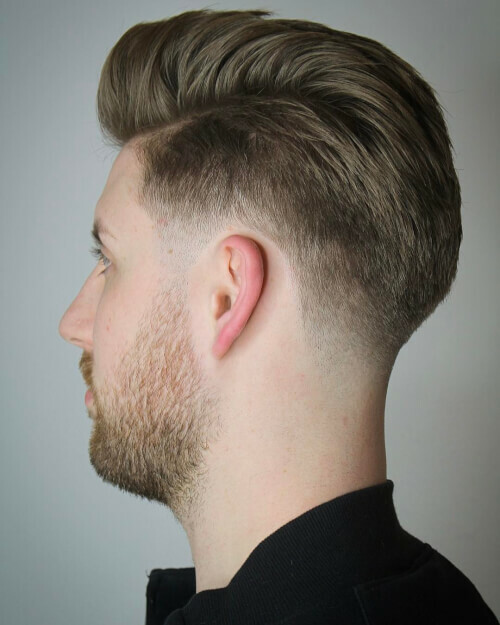 “Clipper over Comb” is a great technique to blend the top into the fade without taking the blend too high. For that, I went back to the Supra ZR with the ceramic 000 blade. I can achieve this haircut with any hair type. Honestly, any face type works as well. 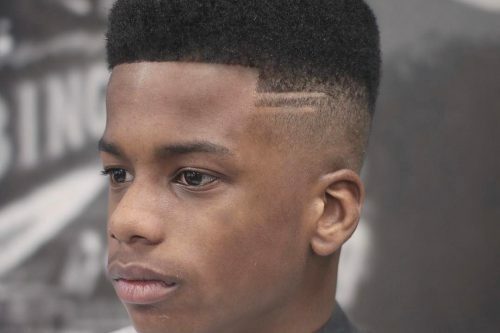 This haircut can be worn by any man or teenager and you don’t need any particular lifestyle to wear a skin fade. I have high school aged clients that show me this cut every time so as a joke, we call it “The Joey” for my client Joey that’s pictured here. 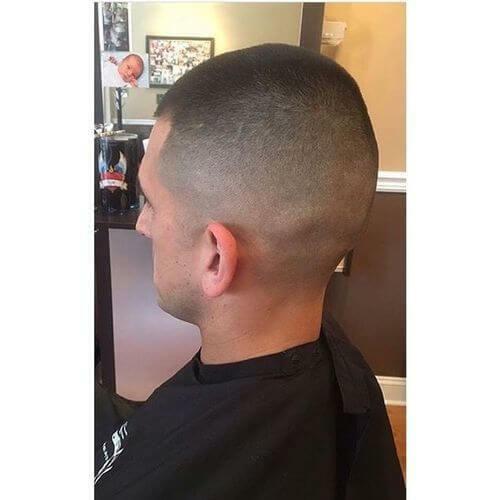 It’s a great haircut for anyone interested in have a clean looking hairstyle. 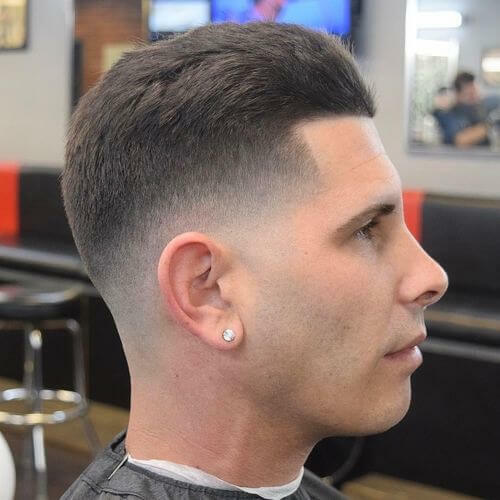 This cut is a classic pompadour with a mid to high skin fade on the sides. It is one of my favorites because of the shape of the fringe which is really fun to blow dry. 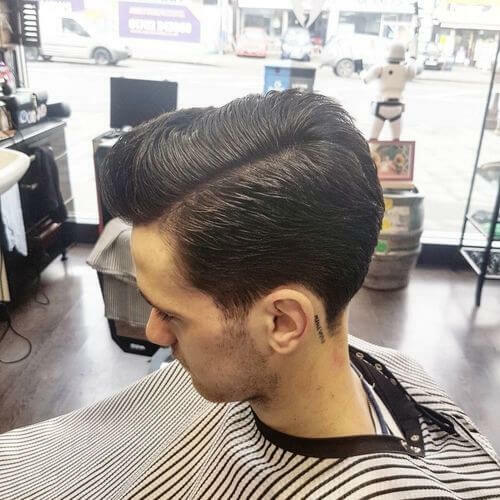 To create this style, I normally use a water-based pomade to give it the shine with a classic look. My personal favorite is Reuzel Blue. I comb the product through to get the classic comb marks. With this style you need a low hairline with reasonably straight hair to get the right shape on the fringe. To get this style with curly hair, you would have to straighten. This style is good for any kind of lifestyle. Just carry a comb with you and you can reshape it anytime, even after wearing a helmet. This look is a combination of modern and classic hairstyles. I’d describe it as a low maintenance/loose pompadour. 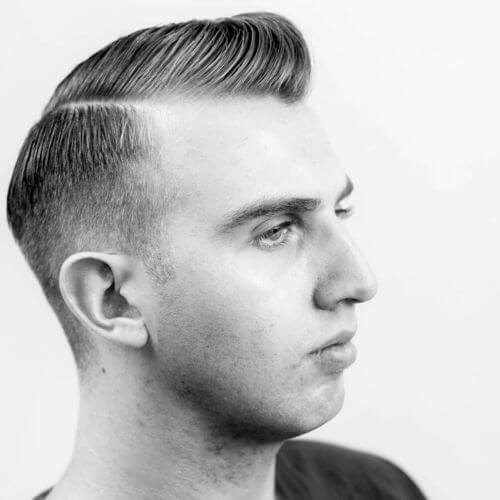 I love the classic barbering styles and always incorporate traditional looks with a modern twist. I like the transition from skin to such thick hair and the texture and loose styling on top. I also like the disconnection at the fringe, allowing it to drop down. I always recommend a pre-style product like Reuzel Grooming Tonic before styling with a hairdryer. This will help keep the shape and look natural. I also recommend a small amount of matte paste/pomade to lock the hair in place, still maintaining the natural “no product” look. 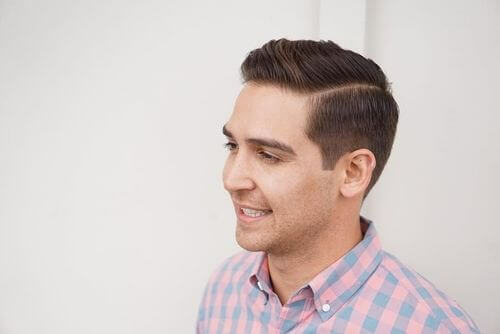 This haircut is ideal for moderate to thick hair. Thinner hair will require more styling and more product. 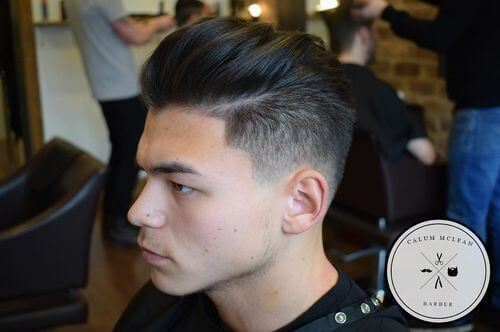 This look is great for gentlemen wanting to keep a fair bit of length on top whilst looking tidy. This cut fits active lifestyles well because it has that loose and relaxed styling and is low maintenance. This cut will typically fit all face and head shapes. This look is what I like to refer to as classic men’s grooming. It is nice and tight around the edges for lower maintenance between haircuts, and has a medium length on top for versatility in styling. My favorite thing about this haircut is that it is appealing to the everyday modern man. With this haircut, you can achieve the professional look during the week, and also switch your styling for a bit of edge on the weekend! 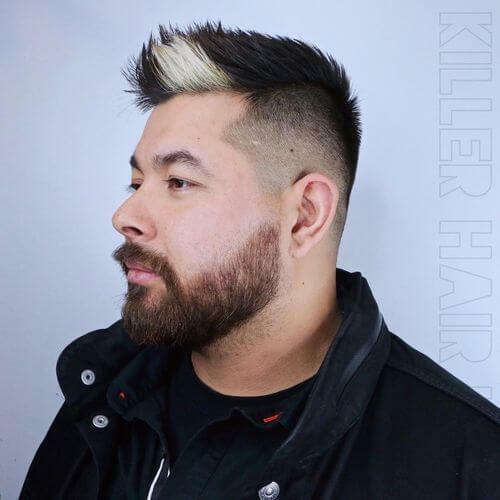 I recommend my clients to switch it up with their styling products so they can achieve different looks with different products, thus giving their look elements of variation through styling.T his particular look was styled with Bumble and bumble’s NEW Sumo Clay and Strong Hold Finish. This haircut is great for all textures, face shapes and lifestyles. Any man looking for a lower maintenance hairline and the option for styling versatility will swoon over this look! I would describe this look as “fashion forward hipster”. It has the nice clean faded sides for longevity, but a longer length on top to style. The color adds that extra oomph to take this look to the next level. This look was prepared in the wet stage with Paul Mitchell “Steady Grip” gel to get the hair to move in the desired direction. It was finished with Paul Mitchell “Matterial” for a nice, strong, matte-textured finish. This look is fairly versatile and suitable for many different hair types if properly prepared with the right product. It creates the illusion of a taller and slimmer face. For that reason, I would avoid doing it on guests with an oblong face shape, but for most guys it will give a nice and fresh look. I would describe this look as the “classic look”. 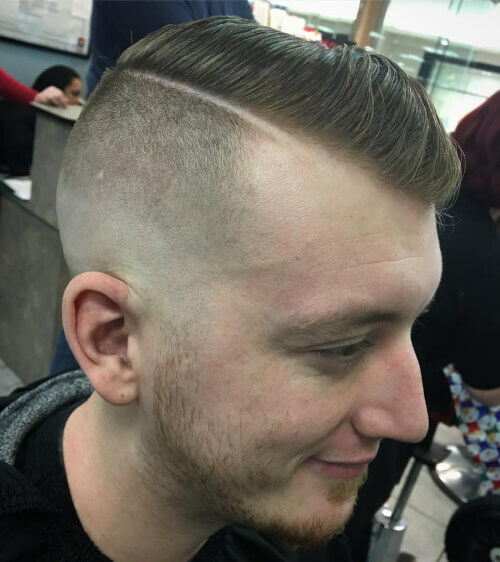 My favorite thing about this style is that it’s simple and it gives my client a clean look that is easy for him to maintain on his own). For this look, we didn’t put any product in his hair because he had plans to head to the gym. This style was accomplished with just a blow dryer. When I do use product, I like to use Layrite because their products are water soluble and their slogan is “easy in easy out”. They have different holds and finishes for everyone’s needs. This style is great for clients with straight hair an perfect for people with a round face shape. This is look is not hard to keep up with. If you have a extra ten minutes in the morning, this style will work for you. You just must have a blow dryer to accomplish this look. This look is the perfect transition into short hair. 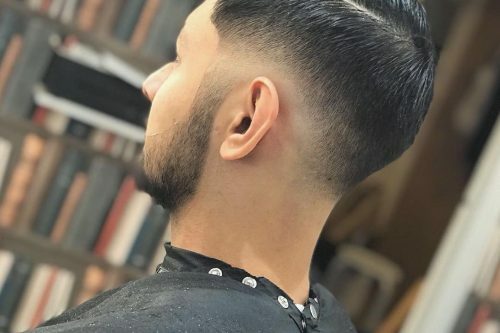 My favorite thing about it is that it is clean around the areas that usually bother most men (the ears and neck), however there is still length left on top. I recommend Mannequin from R+Co for both blow drying and finishing. This cut is perfect for the low maintenance client who does not like to spend too much time styling, but wants to look hip. It is the perfect option for the man on the go.